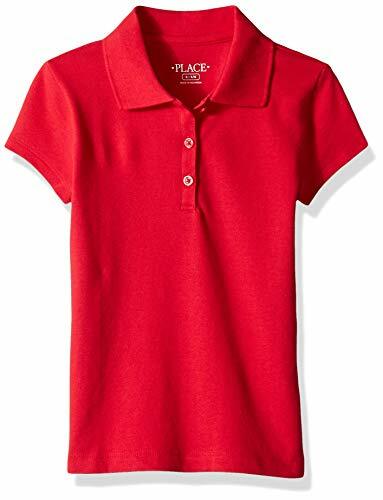 The Children's Place Children's Apparel Uniform Short Sleeve Polo - Pre-washed for a gentle feel and to reduce shrinkage. Button-placket at chest. Tagless label. Short sleeve uniform polo shirt which is very comfortable to wear A uniform basic shell love to wear. Flat knit collar made of rib-knit 100 percent cotton. French Toast Uniforms Children's Apparel SX9103 - Concealed side Zipper For Easy Closure. Adjustable Waist For Great Fit. Above the knee. 100% polyester. 50 wash tested Shrink & Fade Resistant. Decorative tab Detail With Bright Silver Buckle. Style meets comfort in this schoolwear staple with a trendy twin-buckle detail and soft built-in shorts. Pleated Front. Knit shorts For Comfort. The Children's Place - Knit shorts For Comfort. Pleated Front. 50 wash tested Shrink & Fade Resistant. Decorative tab Detail With Bright Silver Buckle. Inner adjustable waist tabs. Concealed side Zipper For Easy Closure. She'll get an a plus for style in this classic favorite 100% polyester. Adjustable Waist For Great Fit. Pre-washed for softness and to reduce shrinkage. Regular Length. Pull-on style with hidden side zipper. The Children's Place Children's Apparel - Regular Length. Knit shorts For Comfort. Flat-knit polo collar made of ribbed 100 percent cotton. Button closures at front placket. Inner adjustable waist tabs. Adjustable Waist For Great Fit. Pull-on style with hidden side zipper. Decorative tab Detail With Bright Silver Buckle. Concealed side Zipper For Easy Closure. Girls long Sleeve Classic Polo. Pleated Front. 100% polyester. Prep up her look with this classic staple for school das or any day. Pre-washed for softness and to reduce shrinkage. Pre-washed for an extra soft feel and to reduce shrinkage. 50 wash tested Shrink & Fade Resistant. The Children's Place Children's Apparel - Pre-washed for softness and to reduce shrinkage. 50 wash tested Shrink & Fade Resistant. Our place is always in style. Value-prices clothes and apparel that are fun and easy to put together. Button closures at front placket. Decorative tab Detail With Bright Silver Buckle. Pre-washed for an extra soft feel and to reduce shrinkage. Knit shorts For Comfort. Inner adjustable waist tabs. Pleated Front. They'll love this style - you'll Love This Place. Pull-on style with hidden side zipper. Adjustable Waist For Great Fit. Concealed side Zipper For Easy Closure. Prep these up with a polo or a button-down for a classic look 100% polyester. Flat-knit polo collar made of ribbed 100 percent cotton. The Children's Place Girls' Uniform Pants - Regular Length. The Children's Place Children's Apparel - 50 wash tested Shrink & Fade Resistant. Button closures at front placket. They'll love this style - you'll Love This Place. Inner adjustable waist tabs. Pre-washed for a gentle feel and to reduce shrinkage. Our place is always in style. Value-prices clothes and apparel that are fun and easy to put together. Regular Length.
. Decorative tab Detail With Bright Silver Buckle. Flat-knit polo collar made of ribbed 100 percent cotton. Pre-washed for softness and to reduce shrinkage. Pleated Front. Add a little primp to the prep. Contrast flat-knit collar made of 100 percent rib-knit cotton. Pre-washed for an extra soft feel and to reduce shrinkage. The Children's Place Big Girls' Long Sleeve Ruffle Polo Shirt - Ruffled button-front placket. Knit shorts For Comfort. Side slits at hem. Concealed side Zipper For Easy Closure. Long sleeve ruffle polo shirt which is very comfortable to wear 100% polyester. Pull-on style with hidden side zipper. French Toast Uniforms Children's Apparel SZ9018 - Inner adjustable waist tabs. Flat-knit polo collar made of ribbed 100 percent cotton. 50 wash tested Shrink & Fade Resistant. 100% polyester. Side slits at hem. Concealed side Zipper For Easy Closure. She will be all prepped for classroom and playground with this year-round essential. Pre-washed for an extra soft feel and to reduce shrinkage. Decorative tab Detail With Bright Silver Buckle. Add a little primp to the prep. Contrast flat-knit collar made of 100 percent rib-knit cotton. Pull-on style with hidden side zipper. Flat Knit Collar. Stripe Grosgrain Neck Taping. Button closures at front placket. Pre-washed for softness and to reduce shrinkage. Ruffled button-front placket. French Toast Girls' Ruffled Pique Dress - Gathers At Sleeve Cap. Pearlized Poly Button Placket. Pre-washed for a gentle feel and to reduce shrinkage. Regular Length. Adjustable Waist For Great Fit. Nautica Children's Apparel - Stripe Grosgrain Neck Taping. Pre-washed for a gentle feel and to reduce shrinkage. Decorative tab Detail With Bright Silver Buckle. Concealed side Zipper For Easy Closure. Flat Knit Collar. Pre-washed for softness and to reduce shrinkage. Knit shorts For Comfort. 50 wash tested Shrink & Fade Resistant. This classic uniform polo provides the perfect look for school days. Cooridnates well with uniform bottoms and layering pieces. Pearlized Poly Button Placket. Cotton Blend Pique. 50 wash tested Shrink & Fade Resistant. Flat-knit polo collar made of ribbed 100 percent cotton. Button closures at front placket. Dropped waist With Ruffled Hem. Gathers At Sleeve Cap. Short sleeve uniform Polo with Two Button Placket. 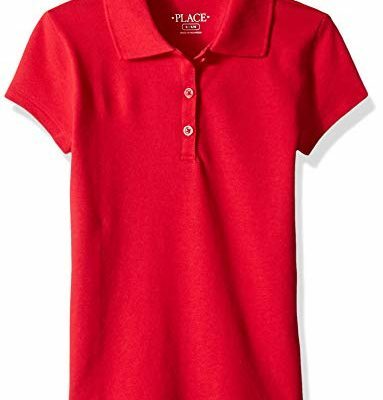 Nautica Girls' Short Sleeve Polo - Pleated Front. Add a little primp to the prep. Contrast flat-knit collar made of 100 percent rib-knit cotton. Regular Length. The Children's Place - Pleated Front. Button closures at front placket. They'll love this style - you'll Love This Place. 50 wash tested Shrink & Fade Resistant. Gathers At Sleeve Cap. Flat-knit polo collar made of ribbed 100 percent cotton. Because he's super into solid style when spring rolls around! 100% polyester. Decorative tab Detail With Bright Silver Buckle. 50 wash tested Shrink & Fade Resistant. Pearlized Poly Button Placket. Concealed side Zipper For Easy Closure. Stripe Grosgrain Neck Taping. Cotton Blend Pique. Our place is always in style. Value-prices clothes and apparel that are fun and easy to put together. Pull-on style with hidden side zipper. Short sleeve uniform Polo with Two Button Placket. The Children's Place Boys' Short Sleeve Uniform Polo - . Flat Knit Collar. Pre-washed for softness and to reduce shrinkage. Side slits at hem. Inner adjustable waist tabs. French Toast Uniforms Children's Apparel SH9061 - Pre-washed for softness and to reduce shrinkage. Flat Knit Collar. Adjustable Waist For Great Fit. 100% polyester. They'll love this style - you'll Love This Place. Pearlized Poly Button Placket. Adjustable Waist For Great Fit. Regular Length. Side slits at hem. With high marks in comfort and fit, this pair is perfect for homework and play. Our place is always in style. Value-prices clothes and apparel that are fun and easy to put together. Short sleeve uniform Polo with Two Button Placket. They'll love this style - you'll Love This Place. Chalk button With Hook & Bar Closure. Inner adjustable waist tabs. Concealed side Zipper For Easy Closure. Side slits At Hem. French Toast Girls' Twill Bermuda Short - Stripe Grosgrain Neck Taping. Functional Belt Loops. Cotton Blend Twill. Value-prices clothes and apparel that are fun and easy to put together. French Toast Girls 2-6x Uniforms SY9098 - Pleated Hem. Regular Length. 100% polyester. Side slits At Hem. Pre-washed for an extra soft feel and to reduce shrinkage. 50 wash tested Shrink & Fade Resistant. Our place is always in style. Value-prices clothes and apparel that are fun and easy to put together. They'll love this style - you'll Love This Place. Stretch, Comfort That Lasts. Pull-on style with hidden side zipper. Cotton Blend Twill. Gathers At Sleeve Cap. Pre-washed for softness and to reduce shrinkage. Short sleeve uniform Polo with Two Button Placket. Cotton Blend Twill. Add a little primp to the prep. Contrast flat-knit collar made of 100 percent rib-knit cotton. Concealed side Zipper For Easy Closure. French Toast Girls' Pleated Hem Jumper with Ribbon - Value-prices clothes and apparel that are fun and easy to put together. Pre-washed for a gentle feel and to reduce shrinkage. Knit shorts For Comfort. Inner adjustable waist tabs. Scoop Neck.